Looking forward to your dream bathroom, which is being built from scratch? Or is it a renovation that is being developed to meet your requirements? What you need is some sound advice. hansgrohe can help you. For instance, with a checklist for achieving your own personalised feel-good bathroom: what you need to think about early on, what technical options are available, etc. So that the bathroom fulfils your needs as ideally as possible. In the new building – or the property where everything is being scrutinised – you have unrestricted freedom in making decisions. From the floor plan to the technology, you can turn long-awaited bathroom ideas into reality here. You can also add innovative technology to your wish list. To ensure that your bathroom has a future. Consider first: Who uses the bathroom – single person, shared accommodation or a family? What is it supposed to be – a purist solution or a spa area? Are you aiming to create a place of retreat, or a bathroom combined with the sleeping area? You also need to take into account possible future needs: The bathroom for all generations gives you peace of mind that your investment will pay off in the long run. Especially if you require assistance at some stage. Then set a budget. Also, pick a style early on. This will make your search for suitable elements and combinations easier. Our download will help you not to forget anything. Just tick them off item by item. To create your dream bathroom, perfect preparation is key: on this checklist, note down for the dealer what needs to be kept in mind when planning. Plus your requirements for the new bathroom. Planning a new bathroom involves the prospect of creating your own customised feel-good atmosphere, added comfort and attractive design. What is it important to consider beforehand? Our checklists will help you. Anyone picking up fresh ideas for their new bathroom can make use of technical innovations and trends. Do you dream of enjoying a floor-level shower and XXL showering indulgence? In the bathroom, there have been many developments: ask a sanitary professional in your area about the latest trends and options. You can then use this background knowledge to let the architect or interior designer know exactly what you want. The new bathroom needs to be able to stand the test of time: with a concealed solution from hansgrohe, you can remain flexible. 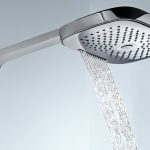 You can opt for an inexpensive hansgrohe product now, and then in the future you can replace it with a top-quality solution. At no great expense either. Here, the basic element is the basic set from hansgrohe, the iBox universal, which is compatible with all of the brand’s concealed mixers. Do you want to plan ahead for the future? A cross-generation bathroom with no tripping hazards provides comfort for everyone. At the same time, you are investing in the value of the property. Also consider using the innovative Select technology with water control at the touch of a button. Its outstanding usability caters to the needs of bathroom users of all ages. Moreover: resource-conserving technologies such as AirPower and EcoSmart make your bathroom sustainable. What do you want the new bathroom to look like? Good ideas for the bathroom are inextricably linked to the question of individual style. hansgrohe makes a distinction between the styles Modern, Avantgarde or Classic. Carefully coordinated ranges offer you assurance that everything will truly match.